Dinner on the top of the fort - what a view! The view from the Eagle Hill Suites. The pool at The Fort. The bathrooms are open, airy and light. Our guides are story tellers of the bush. Shower therapy in the senses to Africa Spa. Up close and personal with the wildlife. Game drives in the Selous. The wildlife of The Selous - our wildogs. The wildlife of The Selous - the king of the jungle! Located on the top of a hill with stunning views over the Ruaha River and Selous plains below, the Eagle Hill Suites are the perfect location for those looking for romance, amazing views and unbeatable service. Each room has a thatched roof and canvas walls lined with mosquito netting. The canvas can be rolled up so that you have a 180 degree view from your bed out over the plains. Each room has a shower inside as well as a bath outside - perfect for sitting in with your loved one and watching the sun go down! The rooms are a two minute walk from The Fort which is the central dining and living area with a swimming pool and an equally incredible view. The lodge offers a personal and holistic style of safari and comfort, every client can spend the day in whichever way they wish. Perfect for anyone who wants to completely escape civilization and get back to nature or who just want some alone time in the true, African wilderness. Most of our guests are honeymooners. Each client or group has their own table around one of the three swimming pools that are strategically placed around the camp, although there are a myriad of dining sites such as private bush breakfasts or dinners by the river or on your private deck outside your room or a packed lunch for your game drive. The Retreat is closed from the end of March to the beginning of June each year, during the wet season. 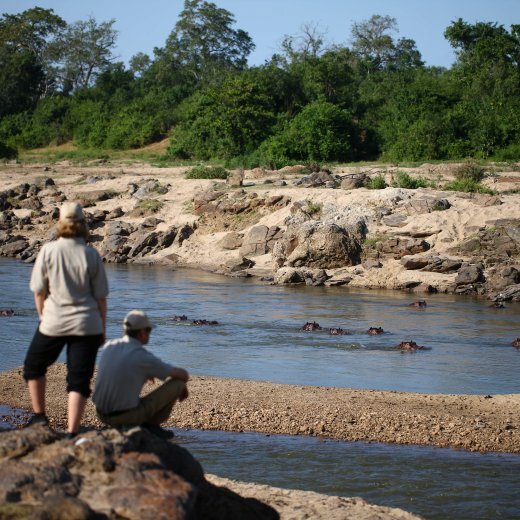 The dry season sets in during June to November and is the best time for game viewing along the rivers. Elephants come out of the bush at that time and predators are more commonly seen.